President Donald Trump's decision to withdraw American troops from Syria was made hastily, without consulting his national security team or allies, and over strong objections from virtually everyone involved in the fight against the Islamic State group, according to U.S. and Turkish officials. The Dec. 14 call, described by officials who were not authorized to discuss the decision-making process publicly and spoke on condition of anonymity, provides insight into a consequential Trump decision that prompted the resignation of widely respected Defense Secretary Jim Mattis. It also set off a frantic, four-day scramble to convince the president either to reverse or delay the decision. "In no uncertain terms, reporting throughout this story is not true," National Security Council spokesman Garrett Marquis said. "It is clear from the context that this false version of events is from sources who lack authority on the subject, possibly from unnamed sources in Turkey." The State Department and Pentagon declined to comment on the account of the decision to withdraw the troops, which have been in Syria to fight ISIS since 2015. Despite losing the physical caliphate, thousands of ISIS fighters remain in Iraq and Syria, and the group continues to carry out insurgent attacks and could easily move back into territory it once held if American forces withdraw. The Dec. 14 call came a day after Secretary of State Mike Pompeo and his Turkish counterpart Mevlut Cavusoglu agreed to have the two presidents discuss Erdogan's threats to launch a military operation against U.S.-backed Kurdish rebels in northeast Syria, where American forces are based. The NSC then set up the call. In the following days, Trump remained unmoved by those scrambling to convince him to reverse or at least delay the decision to give the military and Kurdish forces time to prepare for an orderly withdrawal. "The talking points were very firm," said one of the officials, explaining that Trump was advised to clearly oppose a Turkish incursion into northern Syria and suggest the U.S. and Turkey work together to address security concerns. "Everybody said push back and try to offer (Turkey) something that's a small win, possibly holding territory on the border, something like that." Erdogan, though, quickly put Trump on the defensive, reminding him that he had repeatedly said the only reason for U.S. troops to be in Syria was to defeat ISIS and that the group had been 99 percent defeated. "Why are you still there?" the second official said Erdogan asked Trump, telling him that the Turks could deal with the remaining ISIS militants. With Erdogan on the line, Trump asked national security adviser John Bolton, who was listening in, why American troops remained in Syria if what the Turkish president was saying was true, according to the officials. Erdogan's point, Bolton was forced to admit, had been backed up by Mattis, Pompeo, U.S. special envoy for Syria Jim Jeffrey and special envoy for the anti-ISIS coalition Brett McGurk, who have said that ISIS retains only 1 percent of its territory, the officials said. Bolton stressed, however, that the entire national security team agreed that victory over ISIS had to be enduring, which means more than taking away its territory. The call ended with Trump repeating to Erdogan that the U.S. would pull out, but offering no specifics on how it would be done, the officials said. Over the weekend, the national security team raced to come up with a plan that would reverse, delay or somehow limit effects of the withdrawal, the officials said. On Monday, Bolton, Mattis and Pompeo met at the White House to try to plot a middle course. But they were told by outgoing chief of staff John Kelly and his soon-to-be successor Mick Mulvaney that Trump was determined to pull out and was not to be delayed or denied, according to the officials. The trio met again on Tuesday morning to try to salvage things, but were again rebuffed, the officials said. The White House had wanted to announce the decision on Tuesday — and press secretary Sarah Sanders scheduled a rare briefing specifically to announce it. But the Pentagon convinced Trump to hold off because the withdrawal plans weren't complete and allies and Congress had not yet been notified, according to the officials. The first country aside from Turkey to be told of the impending pull-out was Israel, the officials said. Word of the imminent withdrawal began to seep out early Wednesday after U.S. Central Command chief Gen. Joseph Votel started to inform his commanders on the ground and the Kurds of the decision. 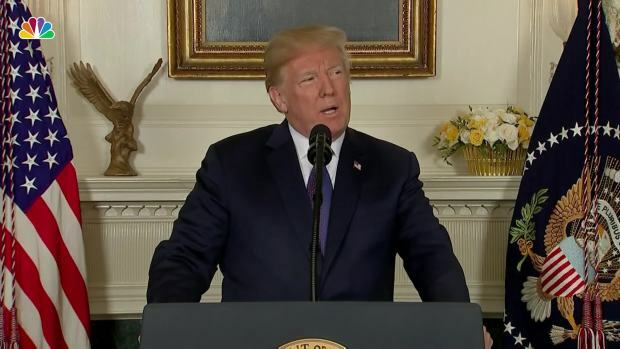 Following the official announcement the White House emphasized that the U.S. will continue to support the fight against ISIS and remains ready to "re-engage" when needed. But in a tweet, the president said U.S. troops would no longer be fighting ISIS on behalf of others. "Time to focus on our Country & bring our youth back home where they belong!"